Does Usagi Need Her Brooch to Stay Sailor Moon? So if that brooch was gone, then…? With those five simple words, the klutzy 14 year old crybaby Usagi Tsukino turns into the sailor-suited soldier of both love and justice, Sailor Moon. Once her power is unleashed, she’s able to fight the toughest monsters the enemy can throw at her, and… umm… heal the baddest of the bad? What I’d like to talk about today is something that has been on my mind for awhile: does the brooch make Usagi into Sailor Moon, or is it just a way of channeling her inner power? Hopefully you’ll join me on this in-depth look into the source of Sailor Moon’s power! Need this – yea or nay? If a reporter were to approach me while I was on my way to work and ask me “is Sailor Moon’s brooch essential to her remaining transformed?” I probably would answer ‘yes’ on gut instinct alone. After all, there are multiple scenes throughout the anime – and even the manga – where Usagi is detransformed (is that word?) by having her brooch damaged or removed. And it’s not even just Sailor Moon, either. Sailor Mercury, for example, is shown to lose her transformation in Urawa’s premonition when her brooch (gem?) gets cut off. Of course, I guess you could make the argument that it wasn’t really a premonition per se seeing as it didn’t actually come true, but I’m willing to accept it as legitimate since it also properly predicted that he would turn into Bunbo and that he would end up fighting Sailor Mercury. What’s especially noteworthy about this is that, other than Sailor Moon and Sailor ChibiMoon, none of the other Sailor Soldiers even use a brooch to transform. Rather, they all use various pens, sticks, or in the case of the Outer Senshi, even lipstick. So if even the other Sailor Soldiers will lose their transformation from losing their brooch – and we’re going to keep calling it a “brooch” for lack of a better term – then I think it’s a safe assumption that Sailor Moon needs it too. Read also: Why Did Rei Pursue Mamoru in the Anime? Before you start writing comments, let me point out that I’m aware Sailor Moon and other members of the Sailor Team have lost their transformations for other reasons throughout the series. However, that’s beyond the scope of this article. The question is whether the brooch is essential. So with all that proof out there, we’re pretty much ready to call it a day, right? I mean, we’re five for five, and that’s just because I’m too lazy to look for if there are any more scenes with the rest of the Sailor Soldiers. Of course, there wouldn’t really be any point in me writing this long post and dragging my answer out like this if there wasn’t a catch. You see, in all two-hundred episodes of the anime’s run, episode 85 is the first and only time we see Sailor Moon take her brooch off. And she stays transformed. Why? Well, personally, I suspect she did it just to spite me. But that’s neither here nor there. Usagi, in her bid to turn ChibiUsa back from the villainous Wicked Black Lady, removes her brooch and summons all of her power as Sailor Moon to remove the darkness from ChibiUsa’s heart. While this is a tempting explanation, when you run a blog entirely on the concept of analyzing every minute detail, no matter how trivial, the last thing you want to do is start discounting random details that don’t back up your point. Besides, I think we can justify this anyway, so let’s pass on that. Read also: What Influence Did Rei's Voice Actress Have on the Manga? Also a tempting explanation, but it frankly doesn’t make any sense. 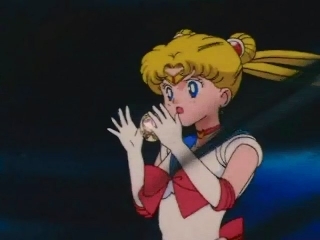 Sailor Moon’s brooch being damaged or destroyed is a pretty central theme to the four aforementioned scenes. Also, that wouldn’t explain Sailor Mercury in the battle against Bunbo, or the fact that the Sailor Soldiers didn’t transform back when they died in the final battle against the Dark Kingdom. After taking into account all of the evidence we see throughout the series, I think we can fit the information together to reach a reasonable conclusion. Basically, we see that damage to her brooch makes her lose her transformation as Sailor Moon, and we also see that having it removed from her chest does the same. Taken as a whole, I think we can reach the conclusion that because Usagi was holding the brooch the entire time, she was still able to maintain her power and stay as Sailor Moon. When you look back at her transformation, and how she uses the brooch to transform to begin with, it’s actually not all that surprising. But it does lead to some interesting questions over how things work for the other Sailor Soldiers. If Sailor Saturn, for example, wanted to take her brooch off and play with it, I’m guessing she’d be fine. But if she took it off and used it like a shuriken, then she’d turn back to the moe-powered Hotaru Tomoe. At least that’s my take on the situation. What’s yours? 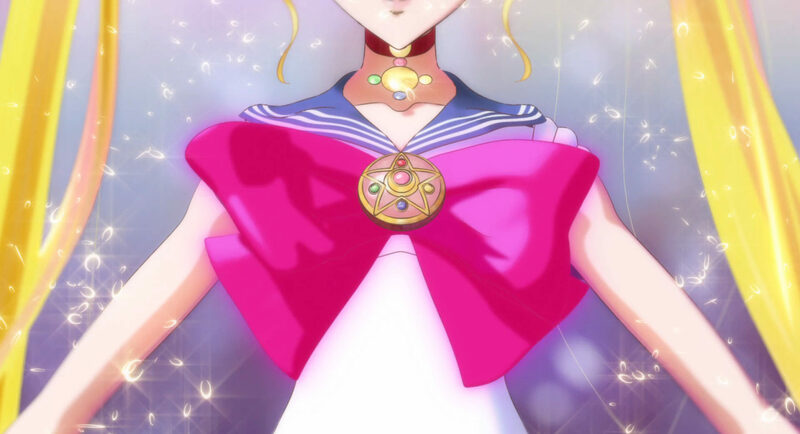 Do you think that the brooch is the source of their power as sailor-suited magical warriors, or was it just a plot convenience and a way for the animation staff to drum up some extra drama during some key, transitional scenes? And how do you interpret the episode 85, brooch-holding scene? I’d love to get some other insights into all this! ← Why Are the Black Moon Clan’s Names Spelled Incorrectly? in full agreement on your assessment of Sailor Moon’s brooch (and by extension Chibi Moon). I think for the other senshi however (Saturn and her lack of transformation not withstanding) I don’t think their brooches hold the power. I think it is their transformation sticks/wands. I always saw the Sailor Mercury vs Bunbo premonition scene as her costume being sliced to shreds by his Swiss army knife arms, not as a detransformation. The animators couldn’t depict her flesh being brutally slashed since it’s a kids’ show, so they did it to her costume to suggest the brutality instead. At least that was how I saw it! I don’t remember any examples of the Inners detransforming because of damage to their brooches either… Then again, the bad guys never went for them the way they did for Sailor Moon’s for obvious reasons. Anyways, I had totally forgotten about ep85! Thanks for the reminder ;). If I could perhaps suggest my own theory. Is that it’s possible the Broach (and indeed other magical objects) posses a form of semi-sentience, and is symbiotically connected to Usagi in a way that it instinctively knows what’s going on and reacts accordingly. Given how emotion driven Sailor Moon is, its probably not to far outside of the realms of plausibility. If for example it experiences a traumatic sensation. Either by being forcibly removed, damaged or drained, it triggers a kind of emergency lock down. Putting itself in a form of stasis to conserve power, until it can be replenished. But when Usagi takes it off willingly or wants to lend its power to someone else, it’s aware of her intentions and maintains (possibly within a certain range). the transformation. 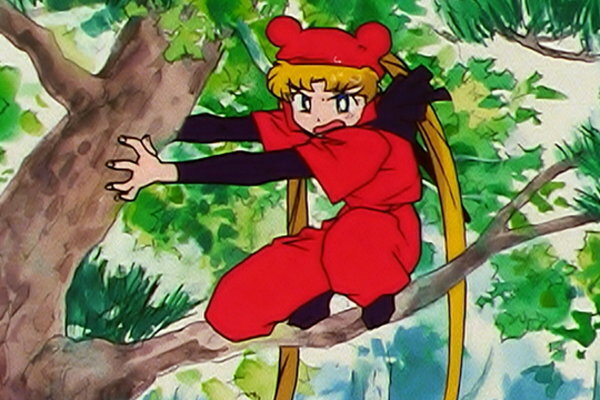 Again the idea that it became an extension of Usagi herself after first contact, rather then just an item. 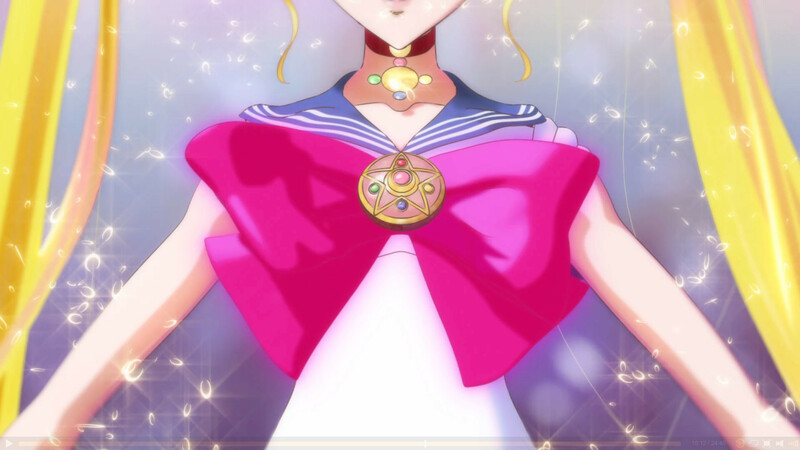 I think the brooch is essential to Sailor Moon (I’m not sure about the other senshi) staying transformed. I think that the only time removing the brooch doesn’t cause her to detransform is when she takes it off herself willingly. As I said I don’t know about the other senshi, but if the same logic applies I think Saturn could use her brooch as a shiruken without a problem because I don’t think whether they’re holding it or not makes much of a difference. Hmm, that’s an interesting idea! In that case, I wonder how far the idea could be taken? Tiara and gloves are probably fair game, but how much of the sailor uniform is actually required for them to be a “sailor soldier,” I wonder? As far as I’m concerned, the transformation brooch is necessary for Sailor Moon to stay transformed. As you mentioned above, Sailor Moon loses her transformation when her brooch is removed or damaged. But, in addition, she also de-transforms when her brooch loses its energy to maintain her transformation. 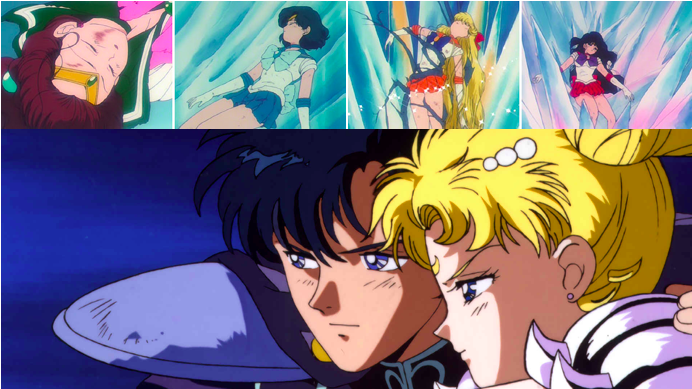 In episode 91, the Silver Crystal inside the brooch lost its glow, and her gloves, boots, and sailor suit soon turned into transformation ribbons. Of course I know it occurred in Usagi’s nightmare, but I’d like to say Usagi, at least, feels the loss of the energy from the brooch makes her transformation undone because she dreamed about such a situation. And the Sailor Moon SuperS Movie is also the good example. When Chibiusa lost her transformation and got stuck in mid-transformation state, Sailor Moon provided her transformation energy from her brooch to Chibiusa’s. It indicates that the brooch plays an essential role to maintain their transformations. Moreover, episode 187 implies the necessity of the brooch, too. 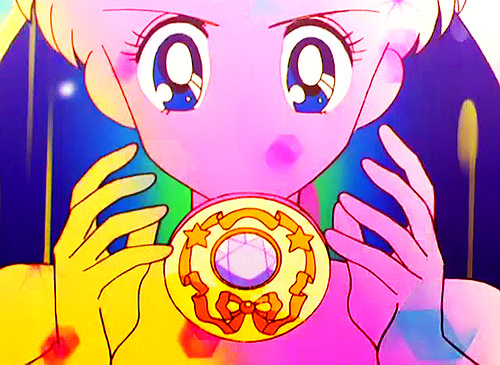 In that episode, Eternal Sailor Moon showed a strong resistance when Sailor Aluminum Siren tried to rip off her brooch. I guess Sailor Moon would dread to lost her transformation. The reason Sailor Moon stays transformed in episode 85 is very simple. The brooch is under her control in that episode, although detached from her chest, but when her transformation is undone, the brooch is always in enemy’s hand. In episode 84, Sailor Moon took off her brooch like in episode 85, but she kept herself transformed. And presumably did so in episode 169 because she transformed into Eternal Sailor Moon directly from Super Sailor Moon form. Thanks for the detailed review! I definitely think you’re right – it seems like having the brooch somehow in contact with her body (or under her control?) is the deciding factor. I know there are at least 1-2 scenes in the manga where she has similar detransformations… I need to check them out. Seems like that’s pretty much the best consensus we can reach here – as long as the brooch is still under her control, then she can still maintain her transformation… I guess?? I’m surprised no one has explicitly pointed out she takes her brooch off multiple times to use the ginzuishou inside to heal baddies of the day and the Black Moon Clan’s sisters in Classic anime. I wonder which brooch Usagi used/had the longest?? Didn’t she take it off each time she healed the four sisters from the Black Moon, as well?